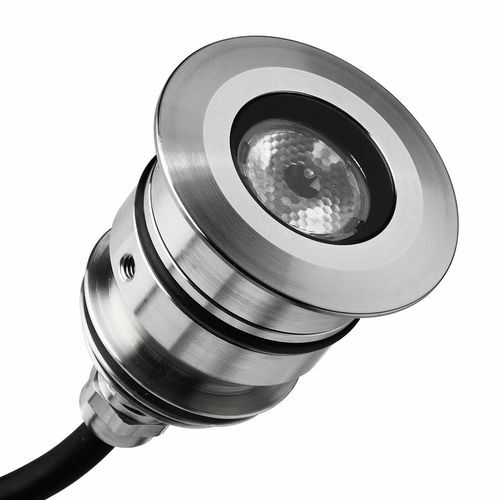 The Sub1 light was created for all those situations in which an aquatic environment needs to be enhanced with accent light. Its installation within a housing in concrete allows it to be used in the side walls of fountains and pools of water while being completely unobtrusive. Body in 316 stainless steel. Extra-clear safety glass with a thickness of 6 mm, ceramic-coated rear. Equipped with 5m connection cable; an extension of up to 30m is available on request. High power LED module on printed circuit board with metal base. Electronic components, dimmable with external dimmer. Highly efficient secondary lens. For recessing into concrete, to be used only with the appropriate housing. IP68 protection rating: total protection from dust and the effects of permanent immersion in water to a depth of 1m.